We all know that the success of a good barbecue is heavily measured by the taste of the food, but what many people don’t realize is that the drink they pair with the meal can play almost as big a role as the food itself. It’s well known that beer and barbecued food go hand in hand, but there are certain types of beer you can be serving with your meals that can make them even more enjoyable, If beer is not your beverage choice, wine can also make a wonderful addition to barbecued meals. Some might be surprised to know that there is much more to pairing wine with food than red wine with red meat and white with Poultry or Fish. Here is a brief guide to help you figure out what types of wine and beer to pair with whatever you’re cooking on the barbecue. If you’re going to be cooking lighter fare on the bbq like vegetarian, fish or light chicken dishes, the ideal beer to pair it with would be a Weissbier or Dunkelweiss. They won’t over power the lighter tasting dishes and will provide a nice supporting taste to the meal. As for wine, try a light white wine such as an Ehrenfelser, Riesling, Muscat or and Unwooden Sauvignon Blanc to compliment the tastes. For pizza. sandwiches or hearty soups, an Amber Ale is a wonderful beer pairing. Pizza and wine however is a little tricky. A vegetable based pizza tastes delicious with a Petite Sirah red wine. If it’s a meat based pizza such as pepperoni or chicken a Zinfandel wine works wonders at bringing the flavours to life. Many people like to spice up their meals when they barbecue, if you fall into this category you should be pairing your food with beers that are lightly hopped such as a Golden or Blonde; Lager also works well. For wine, a Riesling or Pinot Grigio works well and for those of you who prefer red, a Chilean Merlot goes very well with spicy dishes. For heavier entrees such as steak, ribs, pork tenderloin or lamb you’ll want something that can stand up to the food but not be too filling. You’re best to go with a lager as this is not as heavy as ales. 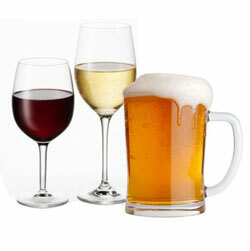 For wine you should try to pair it with a rich red wine like an Oaked Merlot, Cabernet Sauvignon or Shiraz. The full bodied taste of these wines matches exquisitely with the barbecued flavour of these meats. Finally, what would a barbecue party be without the burger, sausage and hot dogs? The best beer to pair with the typical BBQ fare would be a traditional English ale, the hops are able to cut through the grease and provide a refreshing taste. As for wine, a Rose goes very well with just about anything, especially the good old sausage. Grilled food, beer and wine do go really well together, but what really makes a BBQ special is enjoying the quality time with family and friends, trying out new flavours etc. There is no hard and fast rule when it comes to pairing drink with food so try different combinations to find out what you like the best and always enjoy responsibly. This entry was posted on Monday, March 12th, 2012 at 9:53 am	and is filed under Barbecue Recipes, Barbecue Tips. You can follow any responses to this entry through the RSS 2.0 feed. You can leave a response, or trackback from your own site.